View More In Backpacks & Bags. When you get our Commander + Pack Bag, you're getting the Commander Freighter Frame PLUS a 5250 cubic inch Pack Bag. The Pack Bag is great for getting all your gear to your base camp. 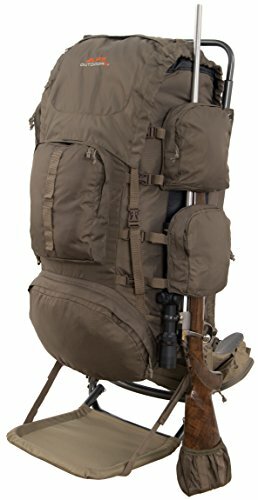 The Pack Bag includes a front pocket, spotting scope pocket, rifle holder, and 2 side accessory hinged pockets, in addition to the main compartment. Once you empty out your Pack Bag, it can be easily detached so the Commander can be used as a Freighter Frame also. The Commander Freighter Frame allows you to haul your meat from one place to the next. The Commander comes equipped with a unique lashing system to secure your meat. With as much weight as you'll be carrying, padded waist belt and shoulder straps are a must. There are pockets for your flash light and knife, as well as a holder for your shooting stix on the lashing straps. With the Commander Pack Bag, you really get 2 products in one - a Pack Bag and a Freighter Frame! Total Weight: 7 lbs. 5 oz., Bag Weight: 2 lbs. 3 oz., Size: 5250 cu. in. If you have any questions about this product by ALPS OutdoorZ, contact us by completing and submitting the form below. If you are looking for a specif part number, please include it with your message.